WHO IS OSCAR ZETA ACOSTA? to be copyrighted a fabricated sculptures of 2-200 must be consecutively numbered by the author and bear the signature or other identifying mark of the author. A “work of visual art” is a painting, drawing, print or sculpture, existing in a single copy, in a limited edition of 200 copies or fewer that are signed and consecutively numbered by the author, or, in the case of a sculpture, in multiple cast, carved, or fabricated sculptures of 200 or fewer that are consecutively numbered by the author and bear the signature or other identifying mark of the author. Looking for that special something? Need a reference photo for your next drawing or painting that won’t cause you copyright problems? There are plenty of resources now, and more opening up, for artists and photographers who need images. "List of animated films in the public domain in the United States"
its truth (if any). Let me know if you find it without value. There is a true law, a right reason, conformable to nature, universal, unchangeable, eternal, whose commands urge us to duty, and whose prohibitions restrain us from evil. Whether it enjoins or forbids, the good respect its injunctions, and the wicked treat them with indifference. This law cannot be contradicted by any other law, and is not liable either to derogation or abrogation. Neither the senate nor the people can give us any dispensation for not obeying this universal law of justice. It needs no other expositor and interpreter than our own conscience. It is not one thing at Rome and another at Athens; one thing today and another tomorrow; but in all times and nations this universal law must for ever reign, eternal and imperishable. It is the sovereign master and emperor of all beings. God himself is its author,—its promulgator,—its enforcer. He who obeys it not, flies from himself, and does violence to the very nature of man. For his crime he must endure the severest penalties hereafter, even if he avoid the usual misfortunes of the present life. roundup pulls sulfate out of body and rheumatoid arthritis attacks body to get to the sulfer. sulfur is required for structured water. sunlight and high sulfur foods are ways body can get the sulfur. also certified organic food diet will eliminate the roundup poisoning. received a computer voice call from 951-651-1985 who stated it was from dept. legal affairs dept of the treasury. i immediately hung up and then called back. a person with a british indian accent answered (he gave his name as william roger) who asked if i was (my name) and i said i was and he told me i was going to be arrested by 11am tomorrow and asked if i had received a legal notice in the mail. he said i was going to be held a couple of months in jail for fraud investigation for falsifying my 2014 and 2015 tax returns. Update: called a 951-651-1985 few hours later and a "officer michael bennington badge no 107623 agent for dept of legal affairs" answers the phone and tells me william roger is not available. he gives me a physical address of 300 north los angeles street in downtown los angeles (no room no) and says i can ask for him at the desk. 10-25-17 UPDATE: Received following email response from the Pasadena Police Dept. very low miles on it. The price was reduced at $1,000 because I'm in a hurry to find a buyer. other buyers interested and I've told them that I am dealing with you. If you lie you corrupt the instinctual mechanism that manifest themselves as meaning then you can't trust them and that's a very bad idea. So the fundamental reason not to lie is because you corrupt your own perceptions then you can't rely on yourself. If you can't rely on yourself then what are you going to rely on in the absence of your own judgement - you have nothing if you lose that. The trustee has a duty to keep the beneficiaries of the trust reasonably informed of the trust and its administration. (1) A statement of receipts and disbursements of principal and income that have occurred during the last complete fiscal year of the trust or since the last account. (2) A statement of the assets and liabilities of the trust as of the end of the last complete fiscal year of the trust or as of the end of the period covered by the account. 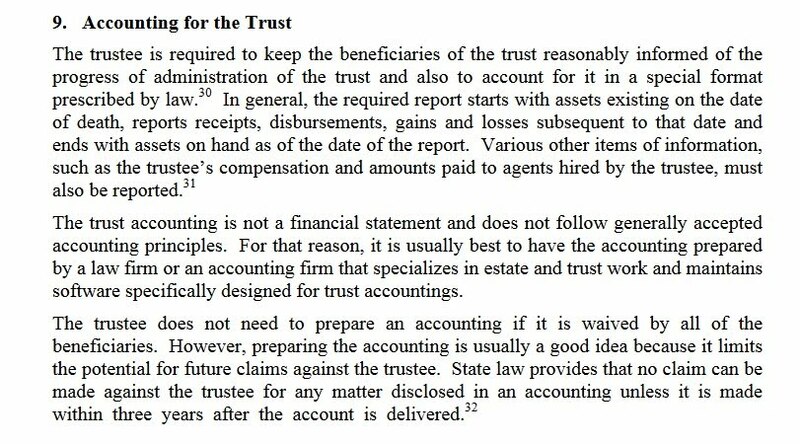 (3) The trustee’s compensation for the last complete fiscal year of the trust or since the last account. (4) The agents hired by the trustee, their relationship to the trustee, if any, and their compensation, for the last complete fiscal year of the trust or since the last account. (5) A statement that the recipient of the account may petition the court pursuant to Section 17200 to obtain a court review of the account and of the acts of the trustee. (6) A statement that claims against the trustee for breach of trust may not be made after the expiration of three years from the date the beneficiary receives an account or report disclosing facts giving rise to the claim. (b) All accounts filed to be approved by a court shall be presented in the manner provided in Chapter 4 (commencing with Section 1060) of Part 1 of Division 3. (a) To the extent the trust instrument waives the account, except that no waiver described in subdivision (e) of Section 16062 shall be valid or enforceable. Regardless of a waiver of accounting in the trust instrument, upon a showing that it is reasonably likely that a material breach of the trust has occurred, the court may compel the trustee to account. (b) As to a beneficiary who has waived in writing the right to an account. A waiver of rights under this subdivision may be withdrawn in writing at any time as to accounts for transactions occurring after the date of the written withdrawal. Regardless of a waiver of accounting by a beneficiary, upon a showing that is reasonably likely that a material breach of the trust has occurred, the court may compel the trustee to account. (c) In any of the circumstances set forth in Section 16069.